The Weekend Academy Has A New Location! In 2006, Dancing Classrooms began expanding throughout the US and internationally to more than 25 locations. To date, the organization is now in cities like Chicago, Cleveland, Lake Charles, Long Island, Minnesota, and Newark. See the full list of Dancing Classrooms Global and more. As the oldest and largest site in the DC Global Network (25 years and counting! ), Dancing Classrooms New York City (DCNYC) serves hundreds of public school classrooms a year. We've had the privilege of working with hundreds of schools over the years and principals and classroom teachers alike speak highly of the impact of our program on their students. The DCNYC program is made up of both our core in-school residency program and the Colors of the Rainbow Team Match, made popular in the hit documentary, Mad Hot Ballroom. Click on the links below to learn more about each program. Dancing Classrooms is an in-school social and emotional learning program that cultivates essential life skills in fifth and eighth grade children though the practice of ballroom dance. The Dancing Classrooms program transforms girls and boys into mature, self-reliant, and elegant young ladies and gentlemen during its 10-week residencies. The Dancing Classrooms program currently delivers our in-school residency program in approximately 200 schools in all 5 boroughs of NYC. The Colors of the Rainbow Team Match is an OPTIONAL, extended journey beyond the residency for schools that want to give twelve of their students a special experience and offer their student body an additional opportunity to foster school spirit. All students who have completed the Dancing Classrooms Residency in their school are invited to participate in our Weekend Academy, which takes place during the school year. These dance training and social development classes are held in Manhattan on Saturdays and Sundays. Under the artistic direction of Alee Reed, the Dancing Classrooms Youth Dance Company was created in 2006 in response to the demand for performances by “the kids from the movie ‘Mad Hot Ballroom.’” Dancing Classrooms is the subject of that critically acclaimed documentary film, and the inspiration for the feature film, “Take the Lead,” starring Antonio Banderas as founder, Pierre Dulaine. You've seen the films, now read the story that inspired them! 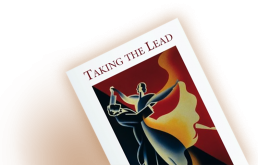 Taking the Lead is the inspiring story of Pierre Dulaine, the world champion ballroom dancer whose creation of the Dancing Classrooms Program has enhanced the lives of more than half a million children.